This past summer The Foundation for Global Sports Development awarded Sir Philip Craven, current President of the International Paralympic Committee, with our Humanitarian Award. He has been a longtime advocate for athletes with disabilities, and he took the time to share with us some insights on the paralympic movement. GSD: As a former Paralympian and now as the President of the International Paralympic Committee, you have the unique position to acutely observe the progress in adaptive sports. Since you have become involved, what have been some of the more impactful transformations in sports for people with disabilities? Also, what progress do you think remains to be seen? Sir Philip: I am in my twelfth year as President of the International Paralympic Committee and if there is one thing that I have strived to achieve, that is to move Paralympic sport and the International Paralympic Committee from being an organization that is a “Disability” sports organisation to that of purely an international sport organisation. What do I mean by that? Well as was plain to see at last year’s amazing Paralympic Games in London, Paralympians are great athletes and that is all I have to say on the matter. What progress remains to be achieved? The Paralympic Games in London attracted 2.78 million paying spectators, making it the third biggest sports event, by tickets sold, in the world following on from the Olympic Games and the FIFA World Cup. There was also a cumulative television audience of 3.8 billion. Therefore many people had the opportunity to experience Paralympic sport in London in 2012, but some nations still do not televise the Paralympic Games on their main channels and this is something that still needs to be achieved. I believe this will be achieved in Sochi 2014 and Rio 2016 when the entire world will have the opportunity to experience Paralympic sport at the highest level. In London last year the Paralympic spirit has never been stronger, both emanating from the athletes’ performances but also from the crowds. This same spirit has to now be abroad and alive in each of our member nations and in each of the 26 Paralympic sports. This is something that we have embarked upon with the launch of the Agitos Foundation during the Paralympic Games in London, and we will ensure through the development work of the Agitos Foundation, in partnership with National Paralympic Committees and Paralympic sports, that the Paralympic spirit and the practise of Paralympic sport does extend to every nation of the world. GSD: The Foundation for Global Sports Development seeks to educate young athletes about clean sport and remaining drug free as they mature as athletes. As we expand our reach to include educating more youth with disabilities, do you see a need for this message to change? Do you feel that athletes with disabilities have different pressures in regards to performance-enhancing methods or drugs? Sir Philip: I wish to applaud the work of the Foundation for Global Sports Development in general but also in particular in the way that they educate young athletes about clean sport and remaining drug free as they mature as athletes. This educative process fits in perfectly with the IPC’s vision of a world where athletes never even think of taking drugs to enhance their performance. Paralympic athletes/Olympic athletes — what’s the difference? And therefore the message is just the same, do not cheat and do not potentially injure your bodies and your minds by even contemplating the use of banned substances. Therefore we support the Foundation for Global Sports Development in their sincere and major efforts to rid the world of doping both in Paralympic and Olympic sports. Well done FGSD! GSD: What words of advice would you offer to a young person with a disability who was interested in learning a new sport? 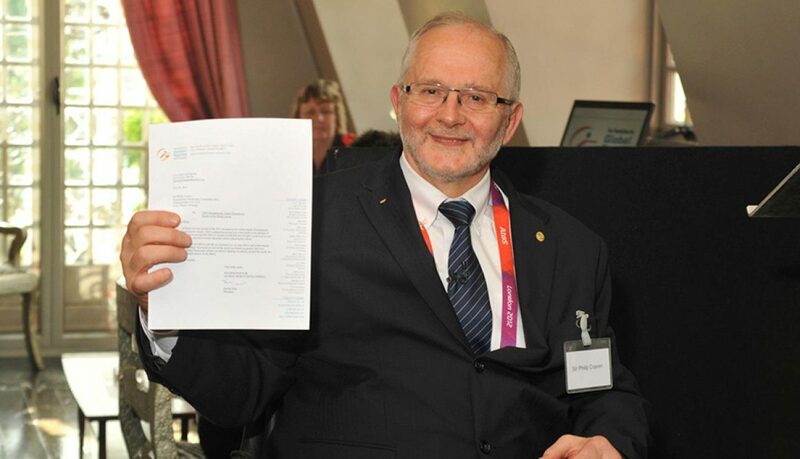 Sir Philip: My advice which would go to any individual who may possess an impairment and who wishes to practise sport, maybe for the very first time, is that they should make contact with their National Paralympic Committee in their home country and learn what possibilities there are in which sports and start playing sport and having fun. As an individual each young person should be free to decide which sport “really” turns them on. They should not be forced to participate in any particular sport and should be encouraged to try as many sports as they can so that they then decide which sport is for them. Should there be no obvious facilities available near to where the young person lives then they could even consider, probably with the support of their family and their friends, to set up such a sports club locally to where they live. This would not only be good for them personally but also good for the community. Life skills that a young person can learn by the medium- to long-term practise of sport are priceless for the life of that individual as they move forward. Play sport, learn about life. 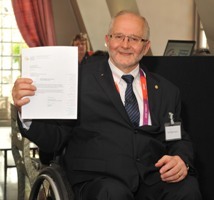 Sir Philip Craven and the International Paralympic Committee will put the $100,000 from GSD towards the AGITOS Foundation. GSD: We were honored to award you with The Humanitarian Award. To recognize your efforts, The Foundation for Global Sports Development donated $100,000 to an organization of your choice, and you selected the Agitos Foundation. Can you tell us why you chose this organization and how you see them enhancing sport in the future? Sir Philip: I was the one who was highly honoured when you decided to award me your Humanitarian Award 2012. Why did I choose the Agitos Foundation? Well that was really a “no brainer”, because as I have said previously what we have to do is to spread the practise of Paralympic sport far and wide throughout the world. It has been decided by the Governing Board of the International Paralympic Committee that this sports development work will be done through the Agitos Foundation and therefore it seemed the perfect fit to me for this wonderful donation of $100,000 to be put to the work of the Agitos Foundation. Thank you, Sir Philip, for your time — both in answering these questions as well as in your tireless efforts to enhance the world of sport for everyone.